After your application has been reviewed and processed, you will receive an Award Letter by mail from the Financial Aid Office. The Award Letter is also available on MyNNMC. Award Notification: Northern's Financial Aid Office begins sending Award Letters to applicants in June, as files become complete. Logging into myNNMC allows you to view and print your award. If you have not logged into myNNMC before, your username will be your Eagle ID number and the password will be your date of birth (six digit format). You will be prompted to change the password at your initial log-in. After logging in, select Financial Aid > Financial Aid Status, or > Award. Important: Award amounts listed on your award letter are based on full-time enrollment status and will be prorated according to your final enrollment status (i.e., full-time, ½ -time, ¾ time). For example, if you are awarded a Pell Grant in the amount of $2,000 and you enroll in six credit hours then you will receive a ½ time award of $1,000. Students are allowed to repeat a course that they have previously passed once; twice if previously failed. A Sample Award Letter from Northern is pictured below with an explanation of key information an Award Letter contains. When you receive yours, read all pages and be sure you understand the information. Your eligibility for aid and the types of awards you qualify for are based on information from your financial aid application such as income, assets, family size, and enrollment. Awards are based on full-time status and will be subject to change according to your enrollment status at census date (3rd Friday from start of term). If any of the information listed in your Award Letter is incorrect, contact the Northern's Financial Aid Office to correct it. **No increase or decrease of awards will be made after census date. Therefore, you must insure you are enrolled in all courses prior to census date. This includes late-starting classes. A. Your Eagle ID is assigned by the BANNER software system and is used for all transactions. Please memorize it and make sure you get your Eagle ID card. B. Estimated College Cost: (Estimated, average direct and indirect costs associated with attending Northern), Direct costs include tuition, fees and books. Indirect costs include your living costs such as room and board, transportation, personal, miscellaneous, child care and other related costs. C. Student/Family Contribution (EFC): The results from your Free Application for Federal Student Aid (FAFSA). The formula approved by Congress that determines the amount you and/or your family can contribute towards your education. D. Other Aid: Inform the Financial Aid Office of any aid received from sources outside Northern. E. Financial Need: Financial need is calculated by subtracting the EFC from your estimated college costs. This amount is what you are eligible to receive from all sources and cannot be exceeded. F. Unmet Need: This is the amount of financial need remaining after your EFC and all aid (including other aid) has been subtracted from the estimated college costs. 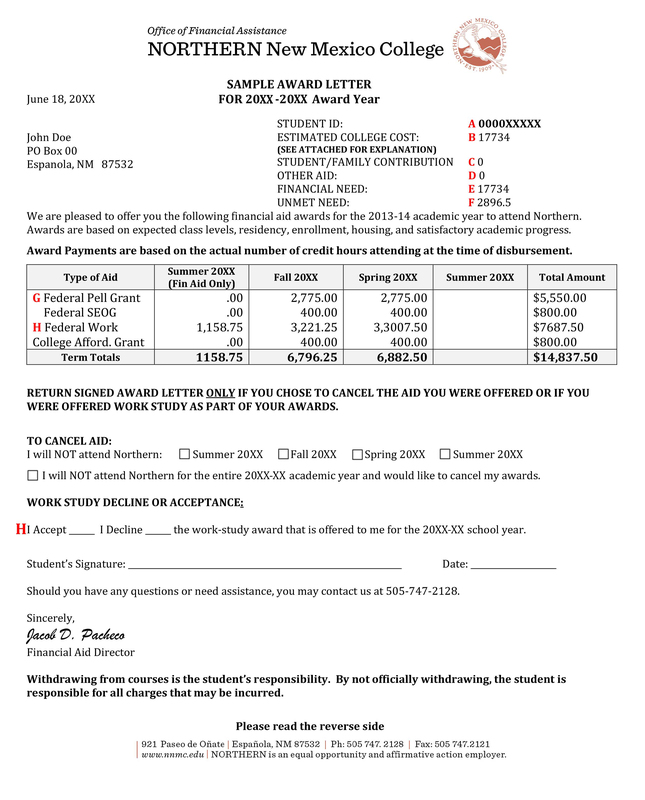 G. Award Amounts: The Federal Pell Grant award shown on your award letter is reflective of full-time enrollment. Payments will be adjusted according to your actual enrollment status at census date (3rd Friday from start of term).